It is with sadness that I must say goodbye to another mate John (Burberry) Cheal who crossed the bar on the 25th. November at times like this one tends to remember or tries to recall the past events that forged a Mateship.A true mate is someone who will share his last piece of food with you, even give you his last can of cold beer on a scorching hot day. He will defend you against much greater odds. He will stick up for you when you are being slandered or attacked, even at the risk of losing his own reputation, job, or whatever is at stake – even his head. A mate is the one person who will come, sit and yarn with you when everyone else has turned their back. A mate is the epitome of the Good Samaritan. He will stick by you through thick and thin. John our friendship was forged 55years ago at recruits school, may you have fair winds and smooth seas to your final mooring with the Great Mariner . May peace and trnquillity be theirs always. On the 29th. Nov.2009 at 1100hrs at the Maritime Museum South Bank Brisbane, the unveiling of a plaque & plinth and the dedication of an FESR Honour Board to be attached to the fwd. deck bulkhead of the Diamantina will climax another first for the FESR Navy Association QLD. Div. This is the third memorial plaque in QLD. 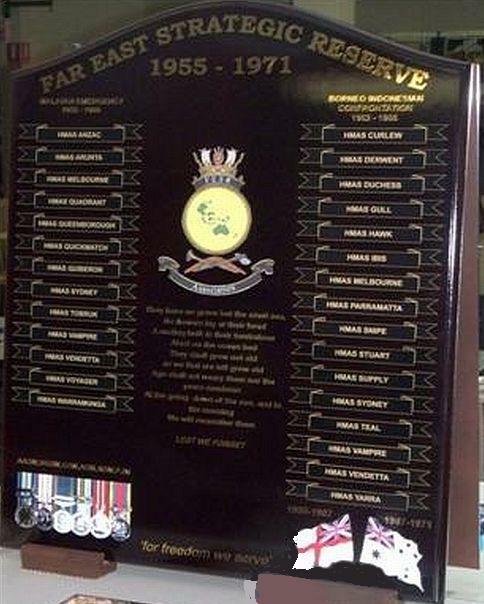 dedicated to the Ships and Crews who served in the Far East Strategic Reserve 1955-1971. It is the first time that one has been erected in a Maritime Museum and the first FESR Honour Board to be placed in a heritage listed naval vessel. The fight for recognition of our service started 11 years ago and while we were successful in some of our initial aims full recognition somehow seems to evade us. These plaque dedication ceremonies are a material way for us to leave a lasting memorial to the future generations and in doing so helps to keep our service in the annals of our countries Naval History. FESR members and friends,ex-naval personal are cordilally invited to attend the ceremony.